The Punisher is a vigilante who considers killing, kidnapping, extortion, coercion, threats of violence and torture to be acceptable crime-fighting tactics. Driven by the deaths of his family, who were killed by the mob when they witnessed a gangland execution in New York City's Central Park, the Punisher wages a one-man war on the mob and all criminals in general by using all manner of weaponry. His family's killers were the first to be slain. A war veteran, Castle is a master of martial arts, stealth tactics, guerrilla warfare and a wide variety of weapons. 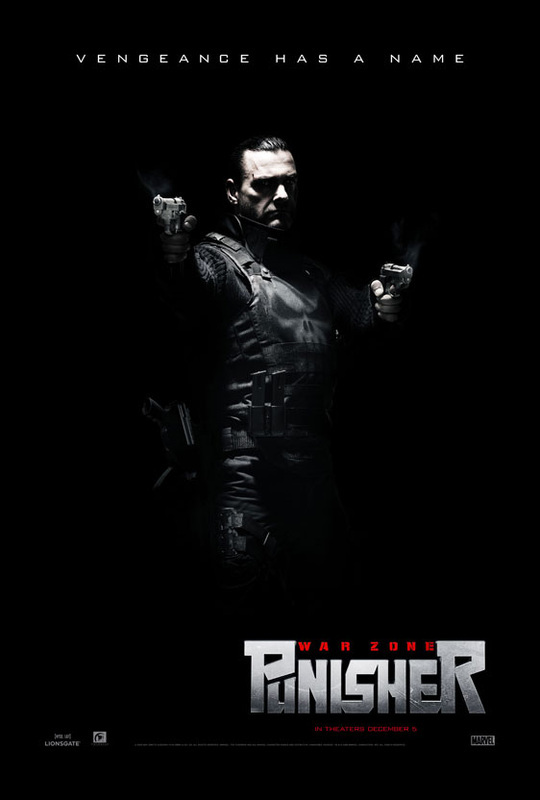 Punisher: War Zone is a 2008 American comic book action film directed by Lexi Alexander; based on the fictional Marvel Comics vigilante/anti-hero the Punisher. 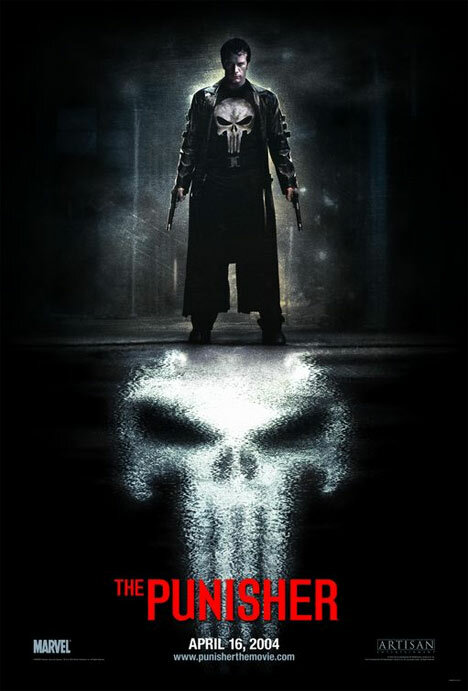 The film is a reboot which follows the original telling of Frank Castle's war on crime and corruption rather than a sequel to 2004's The Punisher, and is the first film to be produced under the Marvel Studios and Marvel Knights production banner, which focuses on films for mature audiences. Irish actor Ray Stevenson replaces Thomas Jane as Frank Castle. In the film, Castle wages a one-man war against a horribly disfigured mob boss known as Jigsaw (Dominic West). The Punisher brings to the screen one of Marvel's top-selling solo comic books and a marquee character whose popularity parallels that of Marvel stars X-Men, Spider-Man, and the Fantastic Four. The Punisher walks through the world we all know, a world darkened by war, crime, cruelty, and injustice. He has no superpowers to battle the evil he sees - only his fierce intelligence, his years of combat experience and, above all, his iron determination to avenge those wronged by society's villains. A gritty tale of revenge and redemption, The Punisher is that rare thing ? a work of entertainment that speaks powerfully to its times. 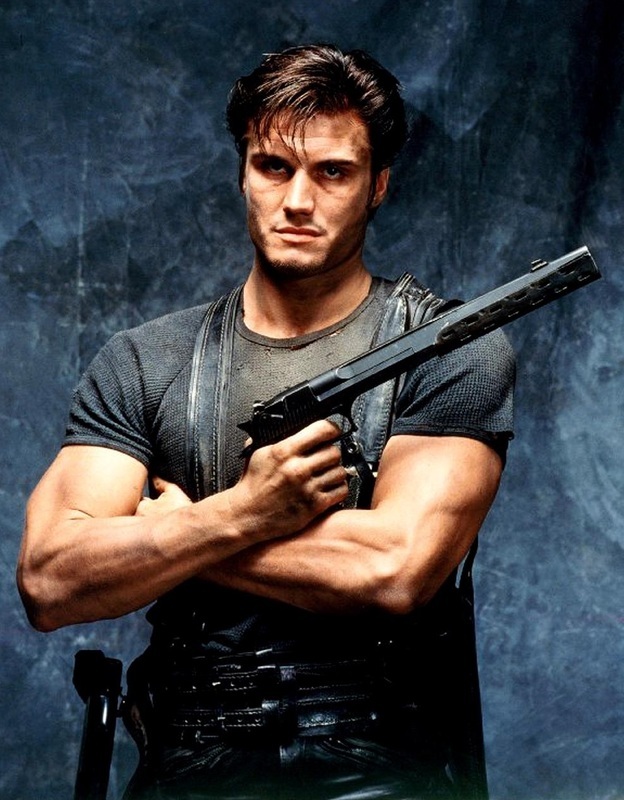 Cast: Dolph Lundgren, Louis Gossett Jr., Kim Miyori. ​Five years after his family was murdered in a mob hit, police officer Frank Castle, who was believed dead, has become a vigilante known as "The Punisher". Living in the sewers and waging a one-man war against organized crime, his only friend is an old alcoholic named Shake. Meanwhile, the Mafia, headed by Gianni Franco, begins a violent turf war with the Yakuza, led by Lady Tanaka. The Yakuza kidnaps the Mafia's children and holds them for ransom in order to bring the American underworld under their control. 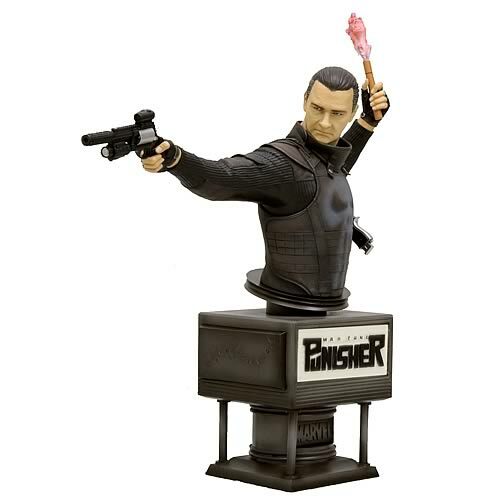 Punisher Movies Prop Peplicas, Figures, Toys and Collectibles! This frontier-style vigilante is one of the most dangerous men in the world: Frank Castle, a.k.a. "The Punisher." With designs straight from the film, the resemblance to actor Ray Stevenson is uncanny in this well-armed, 8-inch tall Fine Art Bust from Kotobukiya. And the base is a special movie marquee that actually lights up! Rid your street (or at least, your collection) of its criminal element by adding this guy to the game!